Maui Wowi Hawaiian Coffees & Smoothies celebrates with entertainment, prizes, and giveaways during its Customer Appreciation Event at the location in Oceanside, Calif.
Maui Wowi welcomes the community for Customer Appreciation! Visitors who stop by will get their chance at the prize wheel and treated to complimentary smoothies. There will also be a chance to win complimentary Tiki size smoothies for an entire year. 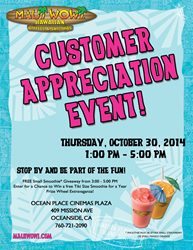 Maui Wowi Hawaiian is saying mahalo to the Oceanside community with a Customer Appreciation Event at its location in the Ocean Place Cinemas Plaza, Thursday October 30, 2014 from 1 p.m. to 5 p.m. PST. The store, which opened this past summer, has been blending fresh fruit smoothies and brewing hot cups of Hawaiian coffee for thirsty customers looking for a break in their day. The Customer Appreciation Event is a family friendly way to thank the customers for their business and for new ones to come and give it a try. Visitors who stop by will get their chance at the prize wheel and treated to complimentary smoothies. There will also be a chance to win complimentary Tiki size smoothies for an entire year. “Maui Wowi wants to bring Hawaii to the Mainland and our Oceanside location has paradise written all over it. This event is to show the community how much we appreciate them supporting our local business and allowing us to be their neighborhood coffee and smoothie shop,” said Mike Weinberger, CEO of Maui Wowi Hawaiian. With plenty of Aloha Spirit to go around, Maui Wowi in Oceanside is the place to be. Complimentary smoothies will be handed out from 3 p.m. to 5 p.m. and will satisfy any taste bud. Maui Wowi smoothies are gluten-free, non-fat, and do not contain high fructose corn syrup. The location also specializes in hand crafted espresso beverages and is currently featuring the Pumpkin Pie Latte as a limited time offer. Since 1982, Maui Wowi Hawaiian has embraced the Hawaiian culture and has been serving paradise in a cup since the day it began, over 30 years ago. From event carts, mall kiosks and stand-alone retail locations Maui Wowi Hawaiian offers premium, all-natural, gluten-free, fresh fruit smoothies, as well as gourmet Hawaiian coffees and espresso beverages. With over 450 operating units in seven countries, Maui Wowi Hawaiian has truly gone “Global” by adding an online store, shop.mauiwowi.com. Now even more customers can experience the prized gourmet Hawaiian coffees and taste the ‘Aloha Spirit’ with a ‘Click-of-a-button!’ To learn more information about Maui Wowi Hawaiian’s, products, locations, or flexible, low cost franchising opportunities, visit http://www.mauiwowifranchise.com.